Orion is one of the most collectable items on the revered Vertigo "Swirl" label. It was always one of the hardest to track down due to it only being released in their native Netherlands. 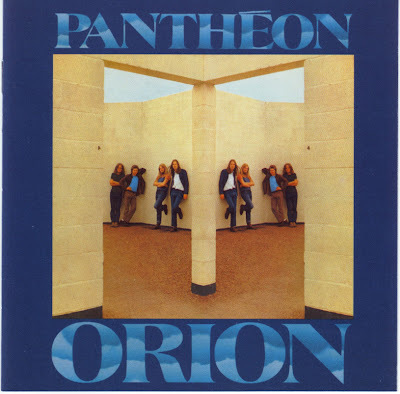 Pantheon are an instrumental progressive rock group with focus on flute, sax and organ and a dazzling, jazzy style rhythm section. Short tracks like "Daybreak" and "Anais" sound like outtakes from a Focus session with beautiful melodies carried by flute. Where Pantheon really shine are on long songs like "Apocalyps", a jaw dropping composition. Carried by at least two melodies you will be whistling for days, the track goes through multiple movements with sax and organ leading the charge. The complex bass and drum work is startling as well the addition of electric guitar, flute and wordless voice adds to the many ideas on display. It is exactly this sense of melody that is missing in most of today's music (underground or commercial). Afterwards, the whimsical short "The Madman" introduces the 19 minute title track. Everything that makes Orion special is highlighted here. The complex instrumental arrangements, the strong comprehension of melody, the variation in instrumentation (organ, piano, synthesizer, sax, flute, choral vocals, acoustic and electric guitar) and different styles (jazz, baroque, rock). It's a whirlwind journey and worth every listening second. A still unknown classic and now everyone has a chance to be a part of it.